Comments on: "Ayn Rand Quotes: I could die for you. But I couldn't, and wouldn't, live for you." Rand was born Alisa Zinov'yevna Rosenbaum to a bourgeois family living in Saint Petersburg. After the Russian Revolution, universities were opened to women, including Jews, allowing Rand to be in the first group of women to enroll at Petrograd State University, where she studied in the department of social pedagogy, majoring in history. Rand's first literary success came with the sale of her screenplay Red Pawn to Universal Studios in 1932, although it was never produced. Rand's first novel, the semi-autobiographical We the Living, was published in 1936. In a 1959 foreword to the novel. After the success of her later novels, Rand was able to release a revised version in 1959 that has since sold over three million copies. Without Rand's knowledge or permission, the novel was made into a pair of Italian films, Noi vivi and Addio, Kira, in 1942. Rediscovered in the 1960s, these films were re-edited into a new version which was approved by Rand and re-released as We the Living in 1986. Her novella Anthem was written during a break from the writing of her next major novel, The Fountainhead. It was published in England in 1938, but Rand initially could not find an American publisher. As with We the Living, Rand's later success allowed her to get a revised version published in 1946, which has sold more than 3.5 million copies. In 1976 she retired from writing her newsletter and, despite her initial objections, reluctantly allowed Evva Pryor, a consultant from her attorney's office, to sign her up for Social Security and Medicare. 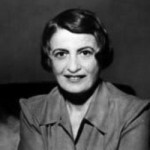 Rand died of heart failure on March 6, 1982, at her home in New York City, and was interred in the Kensico Cemetery, Valhalla, New York.